The Caribbean Family History Group was founded in 2012 by individuals in London and Solihull conducting their research into their families’ history. The blog has been quiet for a few years but we’re attempting to bring it back with events listings, book reviews and interviews that might be of interest for people researching their family history in the Caribbean. The group in Solihull is still going strong with regular meetings held at The Core Library and has established their own collection of records for researchers in the Midlands. So, what would you like to see? What books or records have been useful to you? Part of the Lambeth Readers and Writers Festival 2017 join historian and author Paul Crooks to celebrate the 40th Anniversary of Alex Haley’s seminal book Roots. Paul Crooks, the author of Ancestors, traces his family back six generations to Ami Djaba who were living in the Krobo Mountains in Ghana. Paul Crooks, the author of Ancestors, traces his family back 6 generations to Ami Djaba who were living in the Krobo Mountain in Ghana. Paul’s acclaimed novel, and appearance on BBC’s Who Do You Think You Are with Moira Stuart, inspired a generation to start exploring Black and British ancestry. Paul will talk about his book and his journey to find his family history. Assistance for anyone who would like advice/help with their family research. 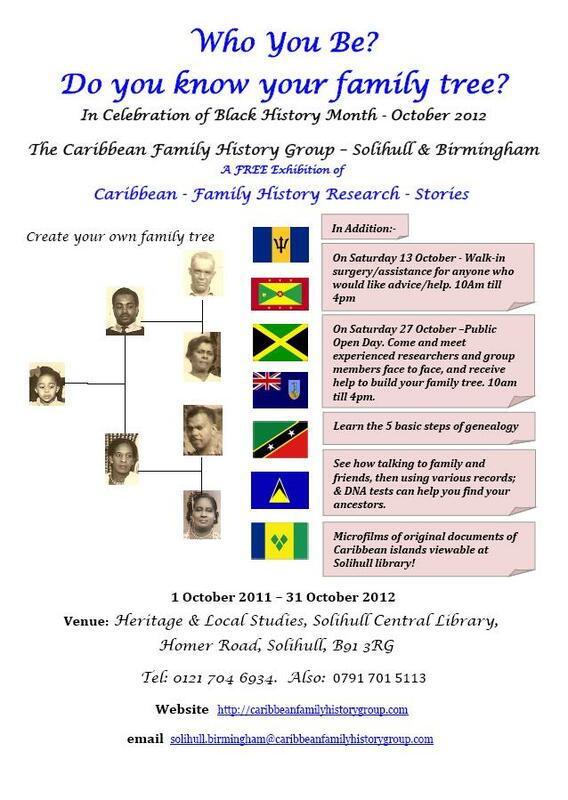 Come and meet experienced researchers and group members face to face, and get help to build your family tree. – Microfilms of original documents from Caribbean available at Solihull library! Celebrate Every Generation Media’s 10th birthday with our East London Routes family history day. EGM is based in east London and has been at the forefront of developing websites, publications, workshops and films around family learning and cultural heritage, particularly among people from minority ethnic heritage. Contributors include: authors Patrice Lawrence, Jacqueline Walker (‘Pilgrim State’) and Kerry Young (‘Pao’), Hackney campaigners Ian Levy and Pauline ‘Hackney Heroine’ Pearce, equality campaigner Simon Woolley, cultural campaigners and historians Arthur Torrington CBE, Stephen Bourne, Oku Ekpenyon MBE, Angelina Osborne, National Archives outreach team Sandra Shakespeare and Sara Griffiths, Cllr Michael Jones one of the youngest politicians in London, Guardian journalist Hugh Muir and Patrick Vernon OBE founder of Every Generation. www.everygeneration.co.uk (new site to be launched on shortly).